For the Magnapop album, see Mouthfeel (album). 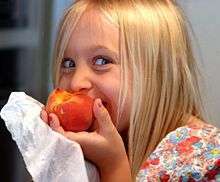 A girl bites into a peach experiencing a number of sensations including sweetness, juiciness, and a variety of textures, which together constitute what researchers call mouthfeel. Mouthfeel is a product's physical and chemical interaction in the mouth, an aspect of food rheology. It is used in many areas related to the testing and evaluating of foodstuffs, such as wine-tasting and rheology. It is evaluated from initial perception on the palate, to first bite, through mastication to swallowing and aftertaste. In wine-tasting, for example, mouthfeel is usually used with a modifier (big, sweet, tannic, chewy, etc.) to the general sensation of the wine in the mouth. Some people, however, use the traditional term texture. Mouthfeel is often related to a product's water activity, hard or crisp products having lower water activities and soft products having intermediate to high water activities. Dollase, Jürgen, Geschmacksschule [engl. : Tasting School], 2005 Tre Tori, Wiesbaden, Germany (ISBN 3937963200). German-language textbook by a renowned food critic covering some, but not all of the above mentionend properties/mouthfeelings.